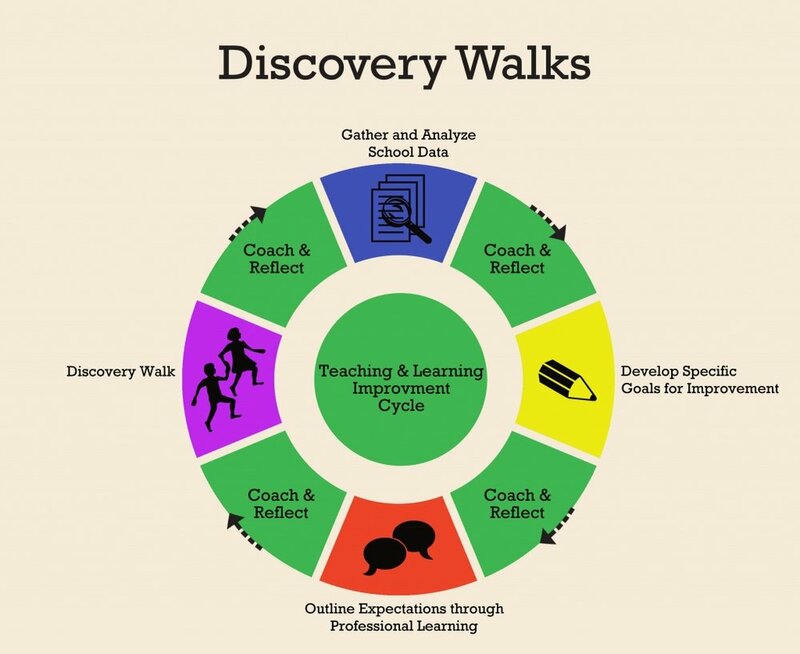 Discovery Walks focus on teaching and learning in the classroom. A unique SLC team of experienced educators and the school principal observe culture, environment and degree of student engagement in each classroom. Observations are recorded on electronic hand-held devices. This data is analyzed by SLC staff and the school principal for common threads and patterns observed. The compiled data is the foundation for a year-long instructional improvement program at the school site. Once the principal and faculty are briefed on the program, quarterly Discovery Walks begin. During each half-day Discovery Walk, classrooms are observed by the team. Using the school’s customized template, each classroom is assessed for evidence of planning, student engagement, and implementation of management skills and level of instructional strategies. Question such as these guide the team’s conversation during and after the Discovery Walk. • Will students become independent readers, writers and problem solvers in the future? • What are patterns in teaching strategies? • What is the level of differentiated instruction? • What are the main instructional strategies? The information obtained from the Discovery Walks data is utilized by SLC staff to help the principal tailor a professional development program to meet the needs of the school. The SLC coach will meet monthly with the principal, assist with the interpretation of the Discovery Walks data and make recommendations for sustained professional development. Surveys of staff and parents, as well as test score analysis, will be utilized to meet challenges and achieve results. Download this flyer about personalized, job-embedded coaching for teachers.